For over 30 years DMYL has been recognizing academic achievement by a U of A law school student. 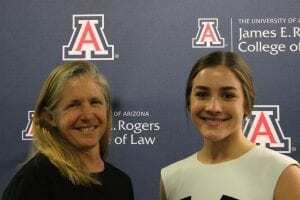 The DMYL Award recognizes the student with the highest academic achievement over the course of their three years at the UA James E. Rogers College of Law. This year’s award was presented at the College of Law Graduation Awards Ceremony, on Friday, May 12. Lisa Anne Smith, the firm’s managing shareholder, presented this year’s award to Margo Casselman. While at the College of Law, Margo served as Articles Editor for the Arizona Law Review. She participated in the Transactional LawMeet Team, the ABA National Appellate Advocacy, and the Fegtly Moot Court Competition. She was also an Ares Fellow, a writing fellow, and secretary of the Jewish Law Students Association. She was a summer associate for Quarles & Brady in Phoenix. After graduation, she will be clerking for Federal District Court Judge David Campbell in Phoenix, then Judge Mary Murguia on the 9th Circuit of Appeals.